The Economist, Christmas for Turkey, November 30, 2010 Click here outlined how important cities have become and how certain cities have been ranked as performing better than others. "CITIES are the great engines of growth in the world economy. Istanbul, with income growth of 5.5% and employment growth of 7.3% over the past year, is currently the world's best-performing city, according to a new report by the Brookings Institution and the London School of Economics". "The report ranks 150 cities from across the globe according to growth in gross value added per person (a proxy for income) and employment. The 150 metropolitan areas represented just 12% of the world's population but accounted for 46% of the world's GDP in 2007. Some cities have plunged in the rankings since the "Great Recession". Dubai and Dublin, the second and sixth best-performing cities respectively between 1993 and 2007, now rank as the most stagnant." Istanbul, a city of legends and dreams, is poised for a 21st-century renaissance where the past lives in the future and the future in the past. Its timeless charm inspires poetry. Click here However, while Istanbul may be the world's best performing city in terms of income and employment growth, the jury is still out whether it is the world's best intelligent city. The top 100 cities account for 38% of global GDP. By 2025, 25% of the world's population will live in the top 600 cities, accounting for 60% of global GDP, according to Mckinsey Global Institute's "Urban World: Mapping the Economic Power of Cities", March 2011. In January 2012, the Chinese authorities announced that for the first time, more than half of the country’s population were living in cities – 690.79 million people, an increase of 21 million, compared to 656.56 million rural dwellers. 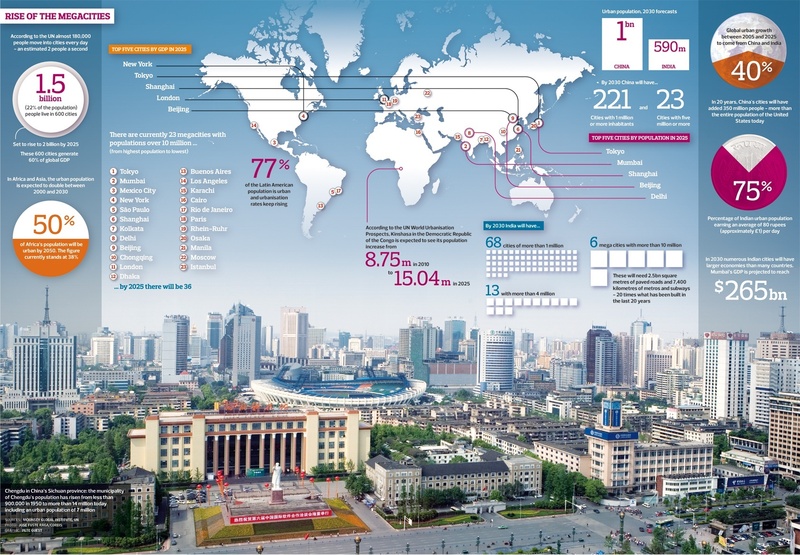 In their article "Megacities and lifestyle changes" in China Dialogue of February 15, 2012, Click here Paul Webster and Jason Burke pointed out that the number of megacities of more than 10 million inhabitants will double over the next 10 to 20 years. For example, the Bangkok city region in Thailand is expected to expand another 200 kilometres from its current centre by 2020, growing far beyond its current population of 17 million. In Brazil, Metropolitan Sao Paulo extends over 8,000 kilometres, with a population of 16.4 million. South Africa's Cape Town city-region reaches up to 100 kilometres. In urban corridors, a number of city-centres are connected by transportation routes often linked to mega-cities and their hinterlands. For example, in India, an industrial corridor is developing between Mumbai and Delhi, stretching over 1,500 kilometres. In West Africa, the greater Ibadan-Lagos-Accra urban corridor spans 600 kilometres across four neigbouring countries. Even larger emerging integrated urban configurations are the mega-regions. The largest is set to be China's Hong Kong-Shenzhen-Guangzhou mega-region, with an estimated population of 120 million. Japan's Tokyo-Nayoya-Osaka-Kyoto-Kobe mega-region is likely to host 60 million by 2015. In Brazil, the mega-region stretching from Sao Paulo to Rio de Janeiro is home to 43 million people. All these dazzling statistics hide an ugly side of breakneck urbanization. While cities may concentrate wealth and economic growth, they are becoming hotbeds of an alarming urban divide in income, space, opportunities, and basic livelihood of food, shelter, health and education. Urban sprawl, social segregation and ecological strains degrade and limit many a city's future growth. A global drive to build "intelligent cities" is quickening to cope with the challenges of sustainability of the world's on-going population growth. An overview of Intelligent Cities is in TimeSpecials of Time Magazine on October 21, 2010. Click here This shows that buildiing an intelligent city is not just a matter of better urban planning and design. A high-level strategy of economic, social, political, regional and ecological policies and effective implementation are some of the prerequsites. Chengdu may offer an interesting case study. According to Webster and Burke, "Chengdu’s mayor, Ge Honglin, contends that the city has avoided some of the problems associated with migration into the cities by encouraging families to stay in the countryside. “Chengdu is the only super-large central city that has narrowed the urban-rural income gap alongside rapid economic growth in China,” Ge says. "Chengdu modified the household registration system in use across the country, known as hukou, which previously prevented rural migrants from registering as city dwellers and benefiting from the city’s welfare services. But at the same time it has extended such services into the surrounding countryside. Farmers as well as urban workers can now receive pension insurance, allowing women over age 55 and men over 60 to claim a rudimentary pension once they have paid premiums for at least 15 years." "Hundreds of new schools have been built in the villages surrounding Chengdu; successful headteachers from city schools are being recruited to move into the countryside, while partnerships between struggling rural schools and the best urban schools are being set up." "The motivation for all these policies is clear – to persuade millions of rural families around Chengdu that they have an economic stake in China’s rapid growth. Part of the strategy involves pouring resources into satellite towns and villages, and creating thousands of new rural communities where families can be rehoused," the two authors explained. In 2000, the State Council issued directives to promote the establishment of "eco-provinces, eco-cities, eco-counties and eco-townships.” In 2002 The Cleaner Production Promotion Law and the Environment Impact Assessment Law were passed. IN 2008, an amendment to China’s Energy Conservation Law held local government officials accountable for managing environmental standards. Still paying a heavy ecological price for decades of breakneck industrialization, China is now cleaning up the country in a decisive move to go green. Building eco-cities is now a rage in a game of competition amongst city mayors. The race to build the next better eco-city is on. In a debate in The Economist dated 22 February, 2012 Click here it is pointed out that as of 2009, 40 eco-cities were in development, including "4 smart-grid pilot cities, 21 LED-street-light cities, (and) 13 electric-vehicle cities". Still, virtually all these "eco-cities" remain on the drawing board. Near Shanghai, Dongtan,a new eco-city designed by Arup, a UK engineering design firm, was proclaimed as China's first, originally thought to be ready for its first intake of residents in time for the Beijing Olympics. It has since stalled. Another, the planned Sino-Singapore Tianjin Eco-City in collaboration with the World Bank, appears more hopeful. It has been delayed and is now expected to be completed by 2020. In their recent book, The Spirit of Cities, Click here two political theorists, Daniel Bell and Avner de-Shalit, argue that a city expresses its own distinctive ethos or value in political, cultural, and economic life. In ancient Greece, Athens stood for democracy and Spartan for military discipline. Modern cities likewise exude their own ethos - such as Jerusalem (religion), Montreal (language), Singapore (nation building), Hong Kong (materialism), Beijing (political power), Oxford (learning), Berlin (tolerance and intolerance), Paris (romance), and New York (ambition). The central message is that cities should avoid homogenization and jealously guard their characteristic historical, cultural, artistic, spatial, socio-economic and political individuality. Like it or hate it, for better or for worse, urbanization is set to define the shape of the world in the 21st century. For countries and municipalities with vision and resources, perhaps the future of cities is bright. Iran provoking America? What would China do if war breaks out? According to World Luxury Association's 2010-2011 annual report, China now accounts for 27 % of the global luxury market, ahead of US at 14 % and right behind Japan at 29 %. The report says China will be the world's largest luxury market in 2012. A KPMG study (April 2011) of China's rapidly changing luxury market finds that China's luxury buyers have embraced emotive factors such as experience and self-reward in attention to status and functional quality. There is a new wave of luxury collecting and connoiseurship. The use of digital media is vital as nearly 70% of the respondents search for luxury brands on the internet at least once a month and 35%, at least once a week. Social media, such as blogs, can also be powerful brand-endorsers. There is an overwhelming preference for big-ticket items such as luxury watches in branded stores. Recognition of the world's leading luxury brands is almost prevalent. There is a very strong country assocaition with brands, particulary for European brands, such as Switzerland for watches, France for fashion and cosmetics, and Italy for footwear. Interestingly, Hong Kong features quite strongly for clothing (3rd) and jewellery (2nd). In a two-part serices "Thorns in the African dream" in China Dialogue dated 31 January and 1 February 2012, Wang Xiaojuan, a project manager at the Heinrich Böll Stiftung China office, explains why China needs to adopt a more sophicated, and more socially and environmentally responsive strategy in her trade and investment projects in Africa. Short of colonization and slavery, China is essentially treading the footsteps of earlier Western industrializing powers, promoting trade in exchange for Africa's resources. While China struggles to project her soft power of peaceful co-existence and win-win foreign policies, the Chinese state and Chinese businesses have not been coping well with a changed and changing Africa. In addition to an integrated model of investments and infrastructural projects designed to benefit the host economy, China needs to put in place a mechanism to ensure that corporate social responsibility, ecological concerns, community livelihoods, social integration, civil society and a multiplicity of other local and international stakeholders are taken good care of. Working more closely with the United National Development Program as well as local and international NGOs may well need to be China's first step. A series of two McKinsey Quarterly reports in February 2012 shows that contrary to popular perceptions, China is innovating rapidly in ways that harness what is the world's fastest-growing economy soon to become the world's largest. Such innovation is driven by quick commercialization even if the product is less than perfect, a rising and often foreign-trained talent pool that is increasingly competitive, superior local knowledge that stays on top of constant changes in consumer demand and market conditions, emphasis on indigenous innovation, and strategic supportive government policies and infrastructure. For global players, playing the Chinese market is posing increasing challenges. "..... the dilemma is clear: how to participate in what will probably be the world’s most dynamic technology growth environment while safeguarding core IP and know-how. These companies must remember that China seeks to use transferred IP and manufacturing methods to create its own champions that can compete with global countries around the world, not just in the local market," explains the "Three snapshots of Chinese innovation" report. "One option is for foreign companies to launch indigenous R&D centers with Chinese universities and institutes and to focus these facilities on developing technologies for unproven but promising next-generation domestic markets. Multinationals that participate in such ventures align themselves with China’s goals while they contain IP risks to markets that are still evolving. Another approach is to focus on local product development in partnership with downstream players such as auto manufacturers. This strategy helps multinationals meet local-technology requirements and provides for more active risk management," the report continues. "China hasn’t yet experienced a true innovation revolution. It will need time to evolve from a country of incremental innovation based on technology transfers to one where breakthrough innovation is common. The government will play a powerful role in that process, but ultimately it will be the actions of domestic companies and multinationals that dictate the pace of change—and determine who leads it", concludes "A CEO’s guide to innovation in China." In any event, innovation, by definition, is never static. Moreover, on a global scale, the winners will be those who manage to stay constantly at the leading edge, to re-invent what has been invented, and to ever expand the horizon of human endeavour. They are likely to be those who could capture the spirit of President Kennedy's clarion call, "Some men see things as they are and ask why. I dream things that never were and ask why not."